$99.95. Available now and on sale! 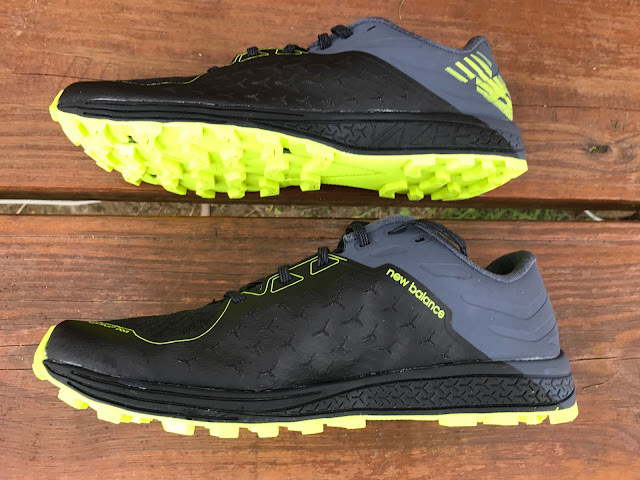 New Balance has packed a tremendous amount of lively, protective versatility into the 8.6 oz, Vazee Summit Trail v2 and even made it 0.2 oz lighter than its predecessor (RTR review), all for just under $100. 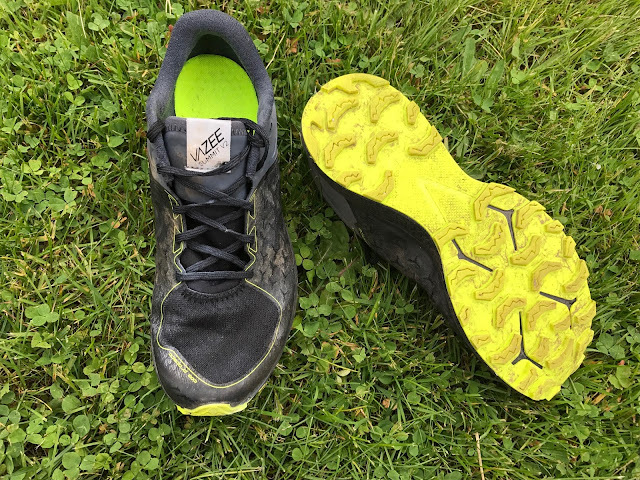 I loved the simple dark look accented with yellow and a blazing bright sole but I was skeptical the Vazee Summit- to little shoe, to narrow under foot, to minimal. The upper looked thin and flimsy, the cushioning low and maybe overly firm, the heel landing narrow and maybe unstable. Well I was wrong on all counts. the narrow heel and mid foot with wide flexible and rock protected forefoot increased agility and stability without any sense of collapse, falling off the shoe, or rock bite. The first run was on my test 3 mile trail loop which mixes a variety of terrain but is not extremely technical was a PR. This timid old runner had some confidence for a change, even more confidence than in the agile Terra Kiger 4, the previous PR shoe. 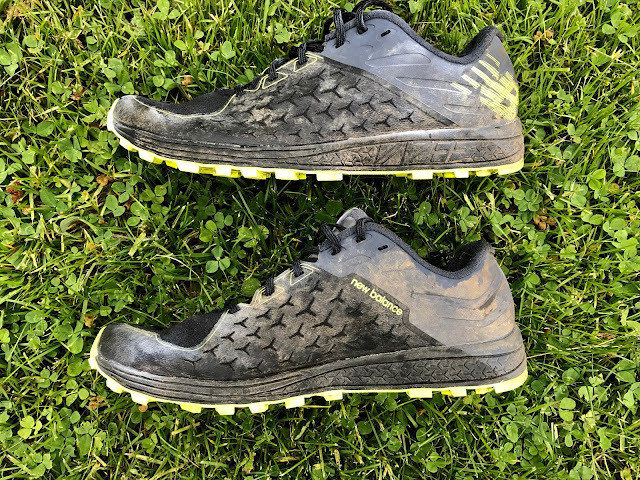 PR in hand, I ran the Vazee Summit at few days later at a 25K trail race with 1600 feet of vertical through steep often wet fields, lots of mud, and well groomed, firm, very rolling nordic trails. Not at PR but I had sure footed grip, speed, and comfort all the way on every type of terrain. I walked away muddy, smiling, none the worse for wear and ready to write this article! The Vazee Summit fits me true to size with thin socks. 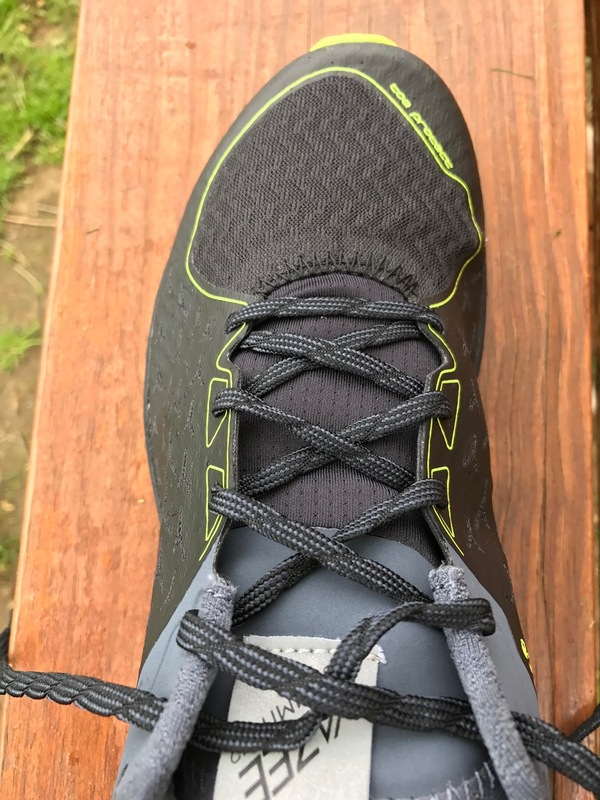 The fit is lower volume, race snug as it should be for such as shoe, but has rapidly conformed to my foot and relaxed a bit. Jeff Valliere reviewed the Vazee Summit v1 last year here. The v2 upper is elegantly simple and effective and a big change from the conventional mesh upper of v1. 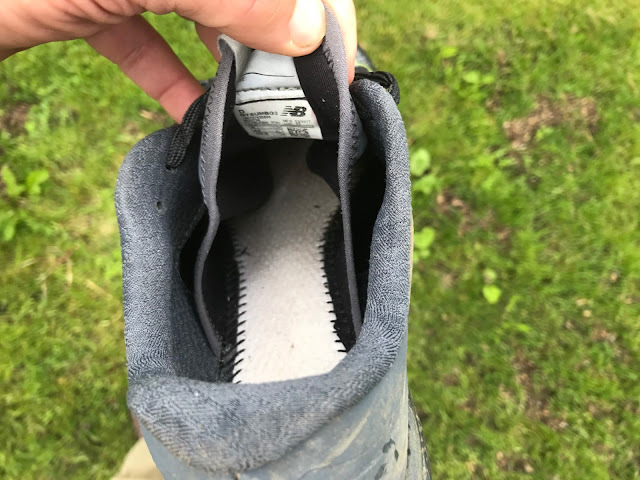 It is made of a single layer of dense but soft mesh with a single piece Fantom Fit overlay at the saddle and running all the way around the front of the shoe, so its fully randed or protected where upper meets midsole all around for wear and to keep water out. A thicker gray blue overlay runs from the lace up over the entire heel counter. This rear piece creates a fantastic heel lock down and contributes to the rear of the shoe stability despite the very narrow heel profile on the trail. The heel counter is very firm across the rear rapidly dipping down on the sides and thus softening further forward. Small, 3 branched slits are cut through for some ventilation and water evacuation. While we have not run the Summit in heat, and worry such a construction may be warm, we can say the upper absorbs very little water and seemingly evacuates it well,. During our wet 25K we never had any sloshing for more than a few seconds after running through deep mud and water and no sense of extra weight. Looking inside we see a full bootie of a substantial stretch material. The bootie is not attached to the mid foot upper anywhere and is essentially part of the front of the shoe. The tongue is un padded and stretchy also allowing it to be pulled high to help prevent debris from sneaking in, very clever. 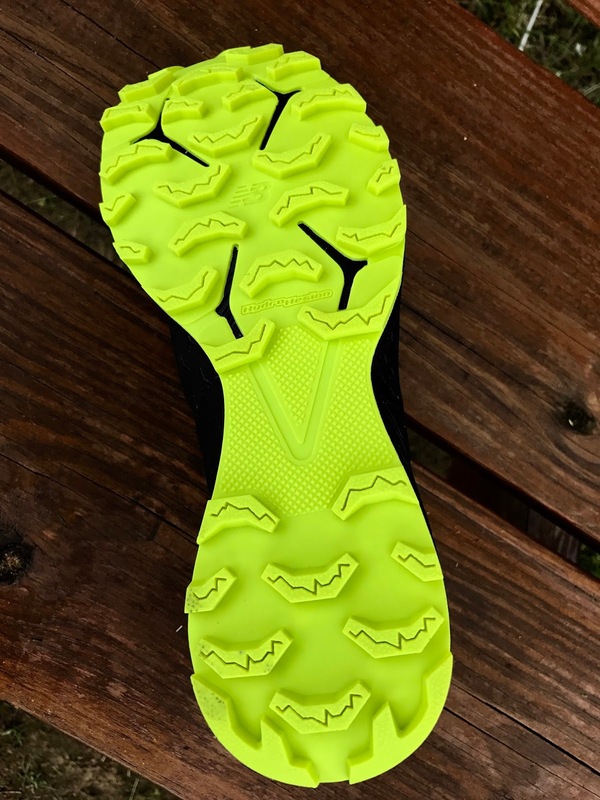 Unlike the similar Salomon Endo-Fit booties, here the wrap is more gentle but also thicker stretch material, less noticeable at the midsole where it attaches but equally effective. It is slightly asymmetrical attaching further back towards the heel on the medial side for more support. The entire system is called Meta-Lock. At least on moderate trails and on uneven fields and single track the upper hold is fantastic. The fit is race snug but all materials are soft and compliant. Any wider and more voluminous or sizing up, and I think the support and agility would start to fall apart. The Toe Protect bumper is very firm and best of all un noticed. No crammed toes or pressure overhead so far. It is asymmetrical running at full height almost all the way from the toe to the curve in the yellow line below on the lateral side (right below), and slightly shorter on the medial side (left below), ending just past the words Toe Protect below. We assume the short Toe Protect on the medial side is to not interfere with toe off. We always looks closely at sock liners in light trail shoes, some slip if not glued down when wet conditions are encountered. Here they are almost completely flat, removable and have numerous ventilation/drain holes. During our very wet 25K they stayed in place but we have not tested on extremely steep wet terrain where there is increased chance of them moving. As the bootie is snug against the sock liner and they are hard to remove and return we expect they will stay put. The outsole is what New Balance calls Sticky Hydrohesion Rubber. Lugs are widely spaced. 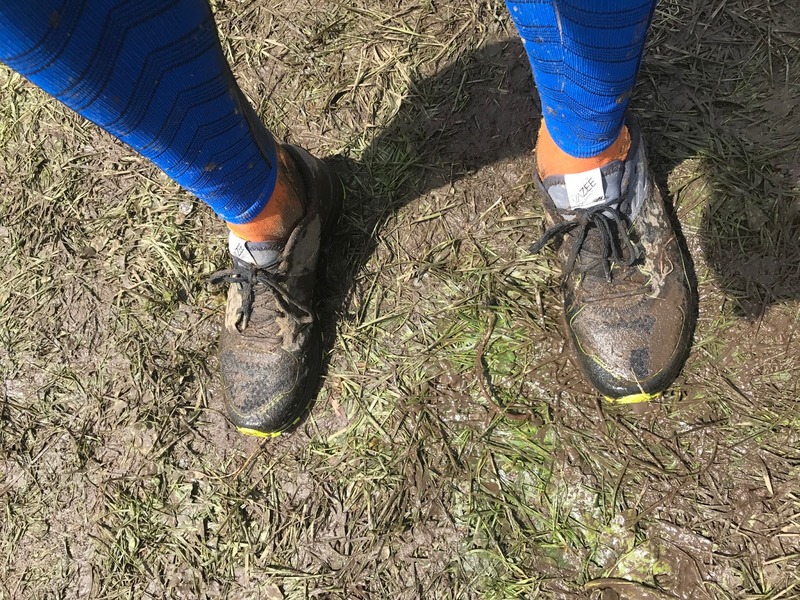 We had no mud, and there was plenty of it, accumulate during our 25K although the mud was generally not of the very sticky variety such as encountered out West. A key feature is the front 3/4 RockStop plate. We have had zero rock nips to date. Amazingly for a trail shoe with such a plate, the flex and feel up front is long and smooth with no abrupt flex point and change in stiffness. Likely this is due to its thinness and length as it reaches far to the back of the shoe. While not certain it appears to go under the arch as well as that area is firm with the bonus of also providing under arch stability. Both the mid foot and heel landing are very narrow, something that concerned us in first trying on. Surprisingly they incredibly stable. Not surprisingly they are also incredibly agile creating a fabulous combination. The midsole is New Balance's RevLite EVA a stalwart of their performance trainers and racers such as the 1400v5 (RTR review) or Vazee Pace . I find RevLite to be firmer than I like, a bit harsh too on the road but on this shoe it shines. Brian Powell of iRunFar swears by the 1400 for all his ultras, including Hardrock. The ride on all terrains to date: hard pack dirt, grass, and moderately, rocky rooty single track has been sure footed, nimble, and fast. Shock is well attenuated, no rocks have bothered, and the shoe flexes smoothly. I was surprised at how secure and stable such a narrow mid foot and heel geometry felt. Credit to the upper hold, RockStop plate and RevLite is my guess. I walked away from my 25K trail race with minimal soreness the next day. Climbing and descending are both excellent at speed. 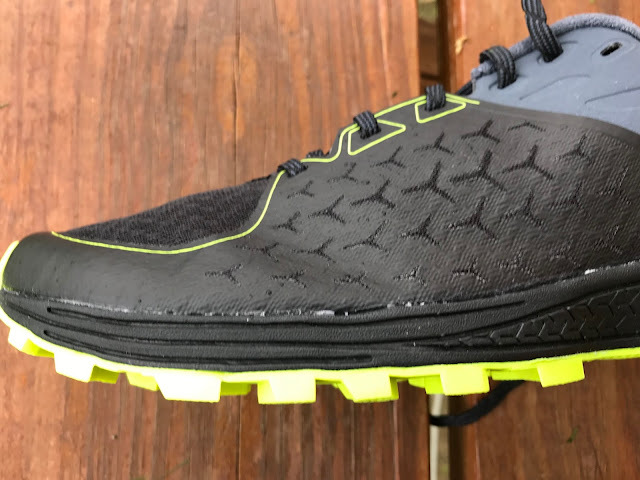 Nobody would call this a highly cushioned ride and on the road it is firm as all RevLite shoes are, but on trail it has a ride with no harsh edges and ultimate security. I have not run on steep off camber rock but expect good results at least when the upper is still newer and not stretched. The Vazee Summit Trail v2 is just plain fun to run. Nimble, supportive and protective it inspires confidence and is fast on any terrain except maybe severe off cambers. Likely to little shoe for most for long ultras, for shorter runs taken lively it is a great option. The design and combination of materials and features brings the weight way down for a trail runner to 8.6 oz yet it does not compromise performance in any way, at any pace, or most any terrain. We would reserve judgment on upper durability and performance in heat until we have more miles on them. At a shade under $100 they are very fairly priced. The 9.7 oz Kiger has a similar low to the ground agile feel and supportive but not over built upper. Kiger is more cushioned and a better choice for longer races. Both are fun to run and agile but for my trail runs, on the shorter side mostly, I give the nod to the Vazee Summit for its better flexibility, more versatile grip and lighter weight. Priced $80 higher, and also an ounce heavier, the Sense Ultra has a roomier more ventilated and downright luxurious upper. It is a better choice for wide feet It is softer underfoot with a slightly lower stack height and when combined with the roomier upper not quite as supportive or agile for me. It may be a better choice for longer races in the heat but not quite the fun and secure speedster the Vazee is. The Vazee Summit was provided at no cost. The opinions herein are entirely the author's. On Sale Now for $81.95!